This is my latest Swiza knife and this is the C05 Silva kaki. I got a very good deal for it during the black week. It is smart to have attention on the prices before so you really find a model or knife that got a nice discount. 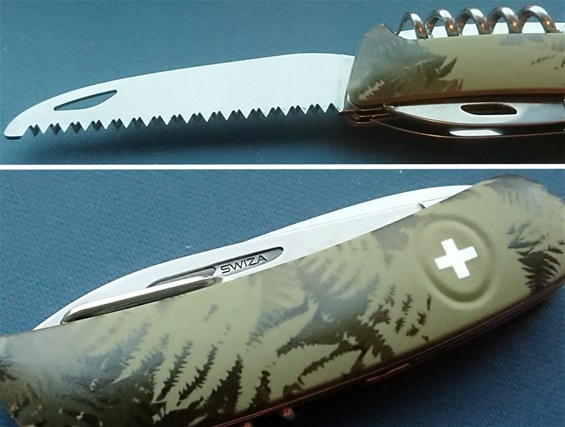 It is a really nice looking Swiss knife in deed. So far I have managed to collect a good selection of Swiza models. I like this construction and quality. They are smooth and easy to open and close. They are also easy to clean and comfortable to use. Most are going in my collection but I had to test some to learn and understand what it is about. It is a sense of relieve to collect when you know they are quality made. I am not surprised that they are very nice. In a way it is not so very easy to hook on to the complete Philosophy of this Brand. You got a heavy influence from serious knowledge about cutlery but you also got a touch of something new. It is a heavy traditional presence in them but also a factor that has evolved.